Unloading liquids delivered in IBC units. 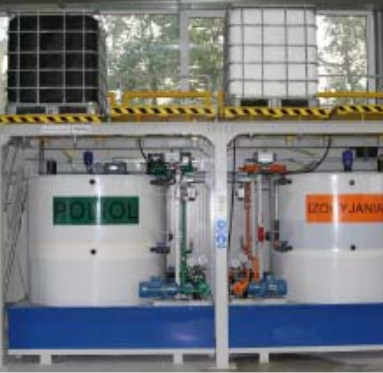 Transfer of liquids to production machinery. Operator Platform:- Allowing easy connection of the drain system to IBC using Camlock quick – coupling. IBC Docking:- Provided with special spring – tilted ramps to allow complete drainage of IBC. Intermediate Tanks:- Standard capacity 1500L, made in plastic or steel. Level Sensors:- Ultrasonic or immersion type to measure the liquid level inside the tank. Drip Trays:- 120% of capacity of the intermediate task. Pumps:- Depending on the pumped substance, the system is equipped with screw pumps, gear pumps, membrane pumps provided with mechanical sealing or hermetically sealed with magnetic coupling. Filters:- Strainers for pumped fluids and air breathers (with water removal) for equalizing intermediate tank pressure. Valves:- Operated manually or by pneumatic cylinder, selected individually based on the applied pressure and pumped medium. Manometers: – Vacuum gauges or pressure switches indicating current negative or positive levels in the system. Mixer:- Particularly for non-homogeneous liquids, with stepless speed adjustment. PLC Control:- Machine control and communication with other equipment via Siemens S7-1200 controller. Other control systems on demand. Place the intermediate Bulk containers onto the provided platform rack. Connect the outlet to start the gravity flow of the container contents. The process is controlled and stopped when the intermediate tank is filled to the maximum level. A mixer is switched to ensure correct consistency and homogeneity of the liquid. The last stage is liquid pumping to the customer’s system or machine depending on the needs. Reduced storage area thanks to centralized storage of chemicals used in production. Relieving the production area, as IBC units are no longer kept by the machines. Eliminated personnel hazards related to contact with substances when handling IBC units. Eliminated machinery downtime for raw materials make – up.